Would you like to win some extra money this week? If so, we have the perfect, week long giveaway for you! 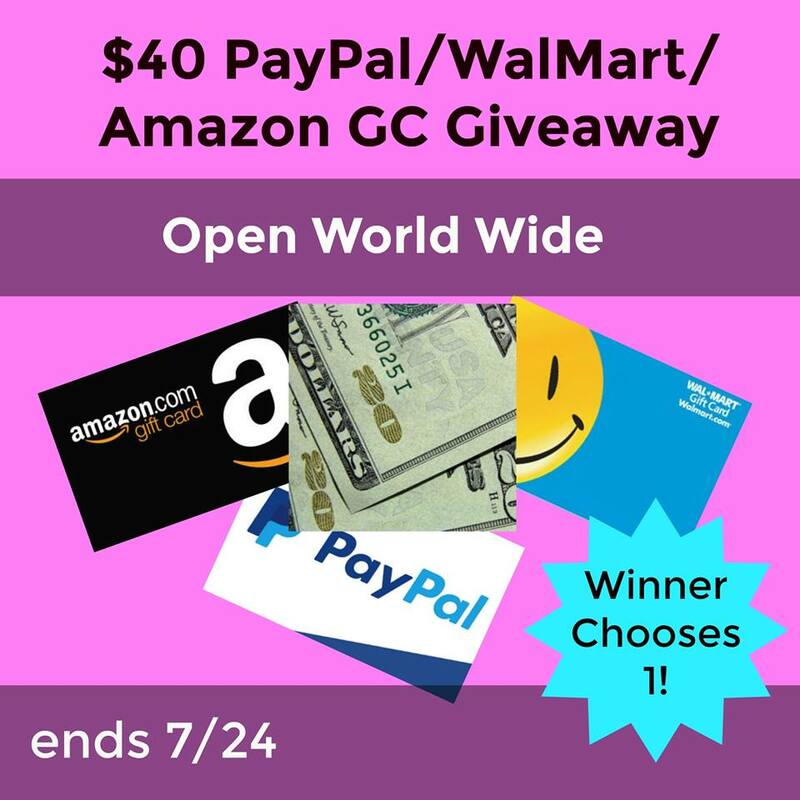 One very lucky reader will win a $40 Paypal, Walmart, or Amazon Gift Card. To learn more, make sure to read the rules below and then enter through the giveaway form! One lucky reader will win $40 Cash. Sweepstakes ends July 24th at 11:59pm ET. New jeans, tops, and shoes. The biggest thing or the most expensive will be books. Haven’t started yet but jeans and tennis shoes are needed. No, we haven’t started school shopping yet, but we will soon. I would have to say clothes, printer ink, and printer paper are some of the bigger ticket items this year! I’ve started planning a little. My kids need notebooks and pencils. I have not started planning yet! Pencils/pens are always a must. my girl needs new shoes, just gone thru another growth spurt and everything is getting snug! No kids, but could sure use the paypal. I’m a teacher, so I’m planning for school all year round. The biggest things my students always need are pencils and notebooks. I haven’t started yet. My kids need backpacks. No kids but one on the way so in a couple years there will be back-to-school mayhem! My kids are adults, so that doesn’t apply. But, the soles of my shoes are falling off. I could really use a new pair. I’m just too lazy to go buy some. My kids are grown but my grandchildren need everything. They grow so fast during the summer. No kids, I don’t envy the mothers who have to shop, it always makes an unwanted hole in any budget. My daughter needs lots of paper and pencils to replenish enough throughout the year. The supply list actually said “Lots of pencils”. She always needs new uniform shirts and shorts and pants, because she’s always growing. She also is a school supply connoisseur and loves to shop for extras…sigh. My two-legged kids are out of school now, but I have plenty of four-legged ones, including a four-week-old kitten I’ve been bottle feeding for the past two weeks and who I will be needing to get into the vet for her first check-up in the next few weeks. This would help cover that. My children are all grown. But, I do try to get something for my granddaughter each year when she starts school. No kids, but my hubby is starting a new job soon, in consulting. Clothes … has grown like a weed over the Summer! I haven’t started school shopping because my kids are out of school and my grandkids are babies. No kids, but I do need to pick up some school things for myself . My son is one so nothing yet! I haven’t started with it yet. No kids at home , but sometimes buy things for the grand kids. Books and pencils. Haven’t started yet, but they’ll be needing pens, paper and notebooks. What is the biggest thing your children need for the school year? I have started slowly. Shoes are going to be a big thing for us. I haven’t started. I haven’t enough looked at the list yet. New clothes is always the most important for these growing kids. The biggest thing they need are books. I do not have kids so I have not started preparing yet. Thanks for the giveaway. I hope that I win. I’m the one going back…. still waiting on hearing various things, but clothes shopping, yeah, I don’t need that. 😉 Books, finding out for certain if it actually is my last semester, etc. I have not yet started with it. Clothes will be the biggest expenses. Yes, I started about 2 weeks ago. I like to get the penny deals at Office Max. They both need some new clothes for back to school but not too much. I haven’t started yet, but I do know my boys will need shoes and clothes. Not yet! Still trying to make the most out of summer. New shoes! I swear they have both grown 3 sizes bigger since last school year ended! I would have to say shoes and sock. My boys go through shoes like crazy!! My son is home schooled and only needs a laptop. He dropped his and this would go towards getting the new one. My son is starting his first year of college and we have been looking at calculators for an upcoming Algebra class. They need school clothes and shoes the most. Our little guys need new clothes. I haven’t even started yet and my daughter needs new uniforms!